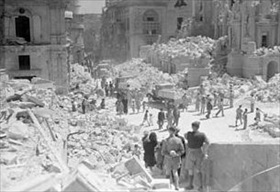 On this date in 1940, one day after Italy entered World War II on the side of Axis part­ner Nazi Ger­many, the Ital­ian Royal Air Force opened a nearly non­stop series of air raids on the Medi­ter­ra­nean is­land of Malta. Lying 50 miles off the Sicilian coast and 200 miles north of the Ital­ian colony of Libya, Malta was a stra­te­gi­cally cru­cial Brit­ish holding, an “un­sink­able air­craft carrier” in the words of Prime Minister Win­ston Chur­­chill, whose nation had lost the air­craft carrier HMS Glorious in a battle in the Nor­we­gian Sea two days earlier. (The Royal Navy nearly lost the carrier HMS Illus­tri­ous east of Sicily to Axis air­craft the following year, on Janu­ary 10, 1941, and did lose the HMS Ark Royal on No­vem­ber 13, 1941, after the carrier had delivered air­craft to Malta.) 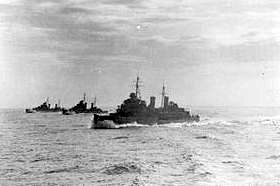 Allied planes and sub­marines based or simply refueling at Malta pre­vented over sixty per­cent of the supplies slated for the Axis North Afri­can cam­paign from getting through. Ger­man Afrika Korps com­man­der Erwin Rom­mel pre­dicted that unless Malta fell into Axis hands, he and his Ital­ian allies would end up losing con­trol of North Africa. Her­mann Goe­ring’s Luft­waffe and Benito Mus­so­lini’s Regia Aero­nau­tica thus directed special atten­tion to the is­land begin­ning in 1941, flying a total of 3,000 bombing runs over a two-year period in an effort to destroy Malta’s defenses and sea­ports. In so doing they drove island defen­ders and civil­ians under­ground for years Operating from Sicilian and Libyan air bases, the Luft­waffe had air supe­ri­ority over Malta in the first four months of 1941. In March and April 1942, more bombs fell on Malta than on Lon­don during the entire Blitz (Sep­tem­ber 1940 to May 1941). Allied con­voys were able to supply and rein­force Malta, while the Royal Air Force defended its air­space, though at great cost in mate­rial and lives. On April 15, 1942, King George VI awarded Malta the George Cross, the high­est civil­ian award for gal­lan­try in the Common­wealth, nor­mally awarded to indi­vid­uals, to honor the is­land inhab­i­tants for their bravery. Just six months later, by Nov­em­ber 1942, Axis for­tunes were dealt two Allied knock­out blows: a vic­tory at the Second Battle of El Ala­mein in Egypt and Allied Torch landings in North­west Africa. Axis attention was yanked away from Malta and the island’s siege effectively ended. Left: Service personnel and civil­ians clear up de­bris on a bomb-damaged street in Malta’s capi­tal Val­letta, April 1942. In 1942 Malta was the most heavily bombed place on earth; in two and a half years 14,000 tons of bombs rained down from Axis war­planes. The tiny is­land (122 sq. miles, or 3‑1/2 times the size of Man­hattan) sat at two marine cross­roads: Italy’s sea route to North Africa and Great Britain’s sea route to Egypt, the Suez Canal, and its In­dian and Far East­ern pos­ses­sions. Which­ever coun­try held Malta could inter­rupt the other’s access to stra­te­gic mili­tary and com­mercial assets both near and far. Right: Three British cruisers provide es­cort ser­vice for Malta-bound supply con­voys. Heavily escorted con­voys sus­tained the besieged island during Malta’s dark­est hours in mid-1942, a time when Malta had tem­po­rarily ceased to be an effec­tive offen­sive base for the Allies owing to its des­per­ate need of fuel for air and naval forces and food for its mili­tary garri­son and civil­ian popu­la­tion. (Malta’s agricul­tural resources could feed no more than a third of its popu­la­tion.) Small quanti­ties of impor­tant sup­plies were sent by fast war­ship and sub­marine during this period. 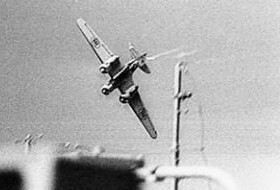 Left: A convoy bound for Malta is attacked by an Italian Savoia Mar­chetti SM 79 three-engine tor­pe­do bomber. The SM 79 Sparviero (Sparrow­hawk) became famous and achieved many succ­esses as a tor­pe­do bomber in the Medi­ter­ra­nean thea­ter, beginning in July 1940. However, Malta-based single-engine, single-seat Glos­ter Gladi­ator bi­planes and Hawker Hurri­canes began taking the shine off the SM 79’s repu­ta­tion, erasing the Regia Aero­nau­tica’s numer­i­cal advan­tage and air supe­ri­ority as more Hurri­canes, followed by Spitfires, settled in on Malta’s airbases. 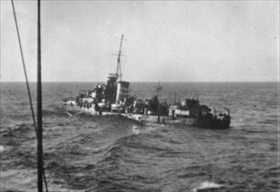 Right: The HMAS Nestor sinks after being scuttled on June 16, 1942. The de­stroyer was part of a Malta convoy of 11 mer­chant ships carrying food, fuel, and sup­plies to the besieged is­land. Having left Haifa in Pales­tine on June 12, the Nestor was heavily damaged by an Italian bomber off Crete. Attempts to tow the ship to base were abandoned.